Would a rose by any other name smell as sweet? Apparently Roklan was willing to bet the answer to this timeless question was an emphatic Yes, as they developed this blatant clone of Atari’s Asteroids. But is there more to Rockball than meets the eye? Read on to find out. 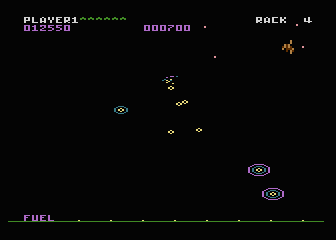 On the surface, Rockball would appear to be one of staggering number of ‘me too’ Asteroids clones that appeared in arcades and on home consoles in the early 80’s. The concept of copyright infringement was still a foreign concept when it came to computer games, so clones ran rampant. While it is easy to dismiss Rockball as one of these clones, there are a number of interesting innovations if one takes the time to dig a little deeper. The first change Rockball made is that the asteroids are now, say it with me, rock balls! Each rock ball is composed of three layers in the form of color circles. Each time you shoot one of these balls, the outer circle disappears and the ball splits into two. The screen can support a surprising number of these balls with a minimal amount of flicker (although they will eventually overwhelm the processor causing flicker and slowdown). The next change is actually a new feature that improves on the gameplay instead of merely changing it. At the start of each of your lives, a rectangle (protection box) will appear before your ship warps in. If there are any asteroids (err rock balls) in the protection box your ship won’t appear until the coast is clear. This welcome features eliminates the cheap insta-deaths that occasionally occur in Asteroids. Unfortunately this means you may have to wait a bit before the screen clears enough for you to warp in. This becomes more a problem at the higher levels. Finally we have the small addition of boundary walls. 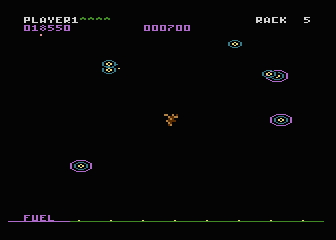 Both the player’s ship and bullets will bounce off the sides of the screen during the game. 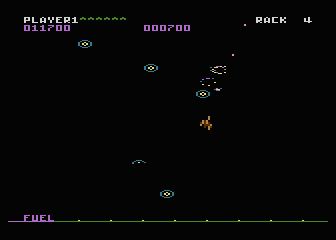 The rock balls however pass right through the screen boundaries, just like in Asteroids. This is a small but welcome change as it makes it possible to bank shots. However this also means that you can now accidentally shoot yourself, so be careful. According to programmer Anthony Weber Rockball had one more feature that would make it different from all the other Asteroids clones out there: Gravity. Occasionally a gravity force will appear and pull your ship towards the center of the screen. If your ship gets sucked in it will randomly appear elsewhere on the screen (including right on top of a rock ball). 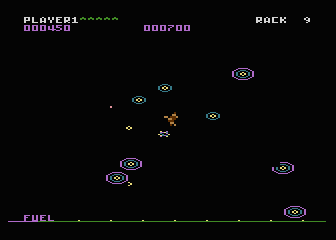 This is equivalent to using Hyperspace in Asteroids, but the player has no control over it. 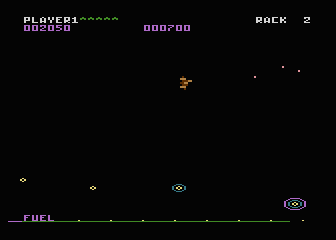 Unfortunately the only version of the game to have surfaced doesn’t appear to have the gravity force coded yet. 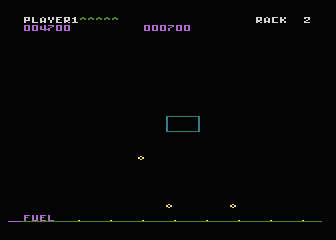 Although it may look like an original programming effort, Rockball is actually a port of an Arcade game. Anthony was shipped the internals of the arcade machine to study while programming the game, but it appears that much like his port, the arcade game was never released. It’s not hard to see why as Atari was starting to become more litigious during this period and probably would have squashed Rockball before it had a chance to sell. Rockball was just about ready for release before the plug was pulled. Only the aforementioned gravity force and sounds are missing, but since Asteroids isn’t exactly a noisy game, this isn’t a huge loss. Another indication that this is still a WIP version of the game is that the player can push the Option button during the game to advance to the next rack. There are 255 racks in all, and the game will wrap around to rack 0 after that. 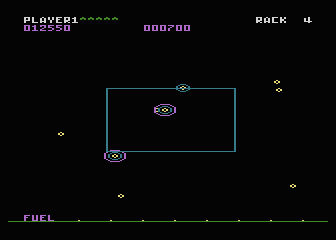 On the whole, Rockball is still an Asteroids clone, but it’s a pretty good one. The only real issue with the game is that it’s HARD. Not only does Rockball play much faster than Asteroids, but the rockballs seem to break apart into more pieces than in Asteroids. Couple this with the ability to accidentally shoot yourself and you’ve got a recipe for frustration. 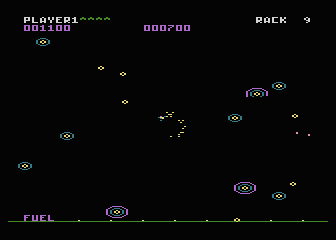 However if you can stick with it, Rockball is a lot more fun than Asteroids ever was. It’s a shame we never got to see this clone, but that’s the way the rockball crumbles.